Are You Killing Time —Or Is Time Killing You? 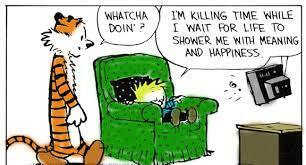 We have all heard the expression, “killing time” or just to “kill time.” It’s been around for a long time. In fact, in 1841, the playwright, Dion Boucicault wrote: “Men talk of killing time, while time quietly kills them.” Other writers have referred to it as well, among them: Henry David Thoreau, Herman Melville, Walt Whitman, George Bernard Shaw, and Octavio Paz. Another expression popular with many people, writers and non-writers alike, is the complaint: There isn’t enough time in the day! Have you said this? I know I have, probably every single day that I am non-productive. The thing that we each have in common with all the writers above is that elusive concept of time. Look at all they accomplished! What about more contemporary authors, such as Stephen King, Dean Koontz, or J.K.Rowling? Is there a secret they all know that we aren’t privy to in conserving time? After all, there is and always has been, 24 hours in a day. So, it stands to reason that the hours in the day are not the problem, but how we use them. me away from the most valuable teacher of all–which is experience. You can’t serve up a gourmet meal without first spending hours in the kitchen, cooking and perfecting your dishes. I have had to learn this the hard way. I have always been a free spirit, and that has been both my saving grace and my problem. Too much time on my hands, but not using it productively. So, as much as I absolutely detest schedules and outlines, I may have to make myself do it. We are never a total free spirit. We always have someone to answer to, even if it is to ourselves. Most importantly however, if you want to be a novelist, you owe you attention to your craft for the sake of your readers. I try to leave my early morning weekdays to writing (nights on the weekends because with kiddo home, it’s harder to write in the am) and get about an hour of time there. If I’m lucky I can do an hour on lunch at work too… more often I spend that time doing my social networking. I use to spend a LOT more time on social networking but I’ve trimmed it back considerably by using lists on twitter, my wordpress reader to catch articles fast that I want to read and share, and doing Facebook last because it’s my guilty pleasure still. There are those who swear by social networking share systems like hootsuite or pagemodo – and I have used them, but I find that I do enjoy the natural engagement that comes with hands on posting. Sometimes that means I spend a little extra time chatting (more than I should perhaps?) but if it ends up meaning a deeper engagement with future readers – isn’t that time well spent? Now I’m blushing (about you being happy to find my blog) and YES, I agree, Anne Rice is awesome. I adore her books & just started following her online. I’m sure I’ll adore her as much virtually as I do in book form. Anne Rice is a big Facebooker too. She engages a lot on there. Another author that is awesome is Diana Gabaldon. I just love her Outlander series, and I have read almost all the books now. I am on book #7. It will be a series of 9 and book #8 just came out. I follow her on Twitter. I tweeted her one time on her advice to new writers. Since she doesn’t follow many on Twitter, I didn’t expect a response. I got one though–short and sweet, she said, “Keep writing!” I know that is sage advice from anyone, but that she took the time to reach out to give me that encouragement really meant a lot to me. That’s really all we can do—keep on keeping on. Marketing gold. Seriously, think of how many times you’ve told that story and how many you’ve told it to. If I hadn’t already (just) started Outlander, I would probably have looked up Diana because of your comment. Her two seconds replying to you has certainly paid off. And I wish more authors realized that. Those that feed the fanbase, those who come to book signings and conventions really do see the returns in book sales. Their fans become a marketing machine for them. That’s worth it’s weight, you know what I mean? Absolutely, you are spot on with that. It IS marketing gold. I don’t understand why more authors don’t do the same either. Have they gotten so big that they don’t want to engage with their readers? I want to be successful of course, but I hope that I never get so uppity that I lose sight of the thing that matters most, the readers.